It's 6.30pm and the door bell goes. Usually this would be a fairly uninspiringly boring occurrence, given the prevalence of missionaries of various religions and sellers of various goods in our parts, but this time it really gave me a shock. The other half decided in his wisdom to purchase us a new door bell... and it plays 'Under the Sea' from one of those Disney films at top volume. Well, that got me up from post-work doze on the sofa and off I went to investigate who it was. Turned out to be a friend who had just had a delivery from her mother who lives back in Romania, and who decided I would be a grateful recipient of some of the more unusual contents. 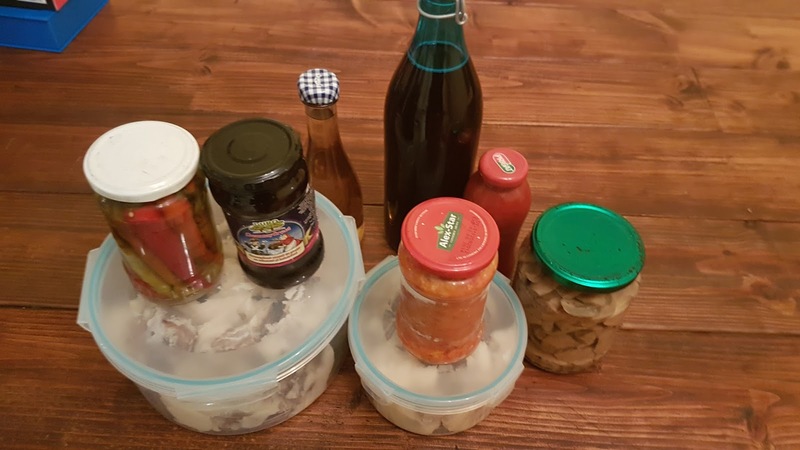 pickled mushrooms, tomato sauce and two bottles of something extremely alcoholically potent. I was too excited that evening not to use something from the delivery, so I decided that the peri peri chicken already half way through grilling needed an accompaniment. 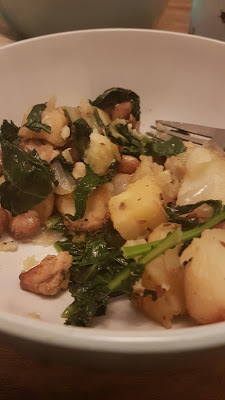 I'd had the foresight (never usually happens) to soak some of our borlotti beans overnight and had boiled them up, and amazingly our chard lasted right through the winter and is still going. As it's in its second year it tastes really sweet and properly juicy. Steam (or parboil) some white potatoes but don't let them go too squishy. Get a roasting pan and toss them in a good tablespoon of Romanian pork fat you've suddenly found in your fridge (or I'd suggest a combination of lard / goose fat / duck fat and olive oil to get the same kind of texture) and add a chunky chopped onion and a clove of garlic to the pan. Season very generously and pop in a pinch of cumin seeds for added punch. Roast for about 45 mins on gas mark 6 / 200 degrees. When it's almost done, take your soft beans (at this point you could use some from a tin if you drain and rinse them) and fry them in a little olive oil, salt, pepper and a pinch of smoked paprika for 10 minutes until they start going a bit crispy. Steam greens of your choice and combine the whole lot. Serve with peri-peri chicken / meat of your choice, or just gobble it up on its own.